Handcrafted eyewear. Made for the extraordinary. Since 1973, Randolph eyewear has been adorned by icons, legends and stars across the globe. Johnny Depp wears Randolph Aviator sunglasses daily. Tom Cruise wears Randolph Aviator sunglasses and Randolph Concorde sunglasses daily and in movies including American Made and Oblivion. Zac Efron wears Randolph Aviator sunglasses in Baywatch. Dwayne “The Rock” Johnson wears Randolph Archer sunglasses in Rampage. Emma Stone wears Randolph P3 sunglasses in Netflix series, Maniac. Al Pacino wears Randolph Concordes in Danny Collins. Ellen DeGeneres wears Randolph Concorde sunglasses casually. Elijah Wood wears Randolph Aviator sunglasses casually. Kid Rock wears Randolph Aviator sunglasses casually. Jon Hamm wears Randolph Aviator sunglasses in the AMC series Mad Men. Sam Jaeger wears Randolph Aviator sunglasses in American Sniper. Ryan Gosling wears Randolph Aviator sunglasses in The Nice Guys. Ethan Hawke wears Randolph Aviator Sunglasses in Good Kill. Jerry Seinfeld wears Randolph Aviator sunglasses in Comedians in Cars Getting Coffee. Michael Weatherly wears Randolph Concorde sunglasses in CBS series Bull. Vanessa Ray wears Randolph Aviator sunglasses in CBS series Blue Bloods. Elyes Gabel wears Randolph Aviator sunglasses in CBS series Scorpion. Robert Patrick wears Randolph Aviator sunglasses in CBS series Scorpion. Michael Keaton wears Randolph Aviator sunglasses casually and in American Assassin. Amy Adams wears Randolph Concorde sunglasses casually. Ciara Princess Harris wears Randolph Aviator sunglasses casually. Russell Wilson wears Randolph Archer sunglasses casually. Eric Bana wears Randolph Aviator sunglasses in Deliver Us From Evil. Matt Barr wears Randolph Aviators in CBS show Valor. Liev Schreiber wears Randolph Aviator sunglasses in Showtime series Ray Donovan. Jay Harrington wears Randolph Aviator Sunglasses in CBS series S.W.A.T. 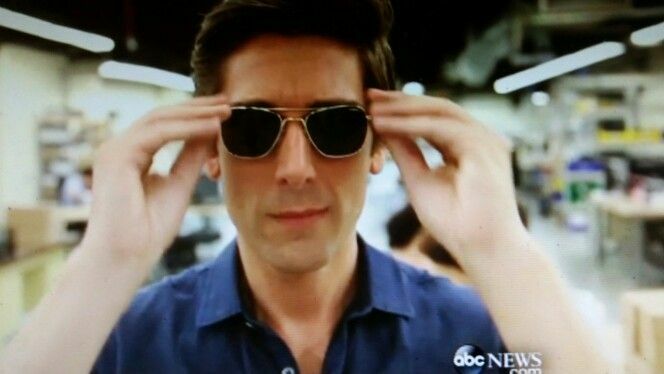 David Muir wears Randolph Aviator sunglasses casually. Titus Welliver wears Randolph Aviator sunglasses in Bosch. Glen Powell wears Randolph Aviator sunglasses in Set it Up. James Greer wears Randolph Aviator sunglasses in Tom Clancy’s Jack Ryan. Brie Larson wears Randolph Aviator sunglasses in Captain Marvel. We’re honored to be worn by celebrities, adventurers and tastemakers alike. Bring Randolphs on all of your adventures. They’re built to last a lifetime — or two.